How does session work in web applications, covers basic concepts of session management. If you are new to web sessions, you should read that post first. This article follows code centric approach i.e. it contains different code samples with brief description. It covers: how to create a session in PHP, how to put some data in session, how to get data from session, how to remove specific data element from session or all of the session data at once. Consider it a reference article of code samples of PHP Sessions. The below PHP file i.e. 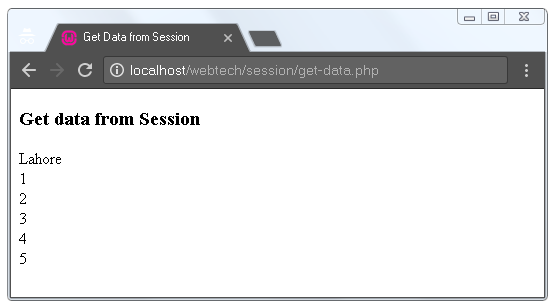 create_session.php creates new session at web server when the page is accessed from browser. session_start() method is used to create a new session. When session is created, a unique session ID is generated, we can read the value of session ID by calling session_id() function. Server send the generated session ID to browser where it is stored as cookie, named PHPSESSID. When user send another request, browser automatically put that PHPSESSID cookie in request. The session ID is used by web server to identify specific user's session. Lets dig further. Before opening the web page, if you enable Developer Tools (using Ctrl+Shift+I in Chrome), the Network tab display the details of HTTP request and response packets. I have drawn blue rectangle around Set-Cookie header. When session_start() is initially called to create a new session, the function put Set-Cookie header in HTTP response. 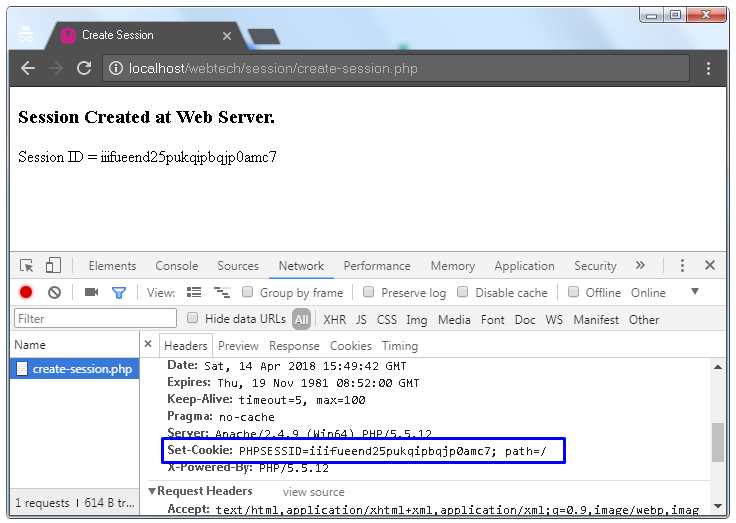 When browser receive Set-Cookie header in HTTP response, it work like an instruction for browser to create a new cookie named PHPSESSID, that contains session ID of the particular user. There is no benefit of creating session at server if we do not save some data in it. To keep it simple, I have not stored any data in the session in above code sample. Next section explains, how to save data in the session. Below code sample i.e. save-data.php save some data into session. Lets see what the above code do. We must call session_start() function in all PHP pages where we want to use sessions. What this function do? When session do not exist already, it creates new session (as I explained above section). If session_start() function finds PHPSESSID cookie in HTTP request, its mean the session was created in some previous web request from same user. So the function use PHPSESSID to decided from which file the user session data shall be loaded to $_SESSION array. So after the session_start() functions is called, the $_SESSION array would contain the previously saved data in the user session. In previous section, we created a session but didn't saved any data in it. So after the session_start() function is called in above code sample, the $_SESSION array would be empty. We may store any type of data in session e.g. int, double, strings and arrays, etc. To keep it simple, I have stored only a string i.e. city name and an array of integers in above code sample. Once the web server has done with processing the request and response is sent to the browser, the server automatically write the contents of updated $_SESSION array in user specific session file i.e. C:\wamp\tmp\sess_iiifueend25pukqipbqjp0amc7. In next request from same user, the data stored in file is loaded back into $_SESSION array. Writing array contents back to file is done by server, so we don't need to worry about it. We just put some data into $_SESSION array and read it back from any other page in current or subsequent requests. Please note that, I have saved value of city and an array of integers just to demonstrate how data is stored in session. In reall applications, we store user specific data in session e.g. user ID, her email, preferences, recently visited products, etc. So mostly, each user session data is different from other users. 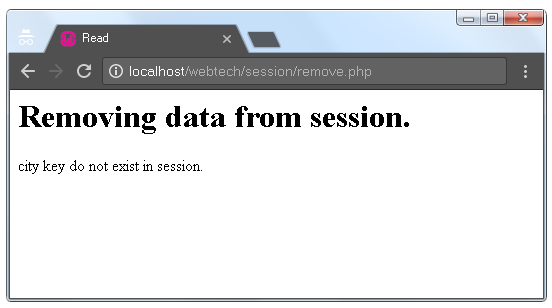 When a user access a web page that reads some data from session, see code of get-data.php given below, session_start() automatically loads session data stored in previous requests into $_SESSION array, as explained earlier. 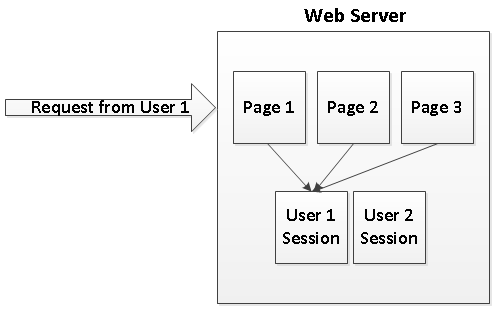 Data that is stored in session can be retrieved in any page of the web application becaues all pages refers to same session for a particular user requests, as explained in below figure. Below code get the city name and array of integers from session that we stored earlier. I have displayed data saved in session in user browser using echo function, we may use the session data the way we want. Below figure shows the output of above code. 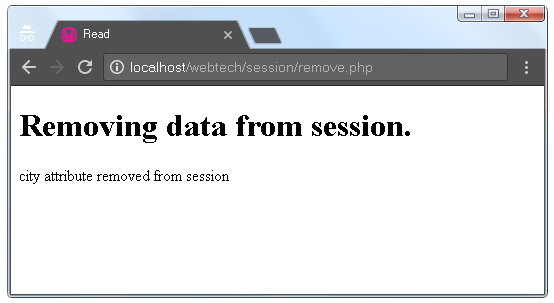 How to Remove Data from Session in PHP? Session is user specific storage at server, we may need to remove some data from session when its no more required. As I explained above, session data is loaded from file into $_SESSION array by session_start() when request comes from browser. $_SESSION is an associative array, so we can add and remove elements from $_SESSION array as we do using normal PHP arrays. Earlier we looked at how to add new values into session, below code removed city attributes from user session.